My best social bud Casie Shimansky and I wrote a guest blog post on my best talent brand bud Ed Nathanson‘s Red Pill Talent blog. The post is entitled 5 Strategies for Employer Branding on Instagram – The Moments That Matter. But I repost it here, because I don’t think the strategies are limited to Employer Brand. I think these are strategies that any brand should follow. That’s what makes Instagram a great social media channel for telling your employer brand story. Aside from having 400 million monthly active users and the key demographics where 90% of Instagrammers are under 35 it’s the perfect place to tell the #LoveWhereYouWork story. 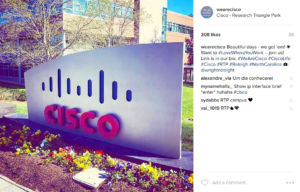 Last summer, Cisco’s Talent Brand team took on the Instagram challenge. As when starting any new social media platform, we wanted to optimize the content we were posting for the channel on which we were posting it. Our Chief People Officer, Fran Katsoudas, talks all the time about the importance of moments that matter to employees. In employer branding, we’re sometimes even talking about the moments BEFORE the moments that matter. But it’s that idea of visually communicating the moment that makes Instagram the perfect channel for highlighting culture. Take a look at Instagram’s video about using their platform as a business. The whole video is about the moment that matters. Strong photography. Instagram is the only social media platform that is all about the visual. Text on images? Put those on Facebook. That’s not what distinguishes Instagram as a way to tell the story. Instagram is all about the photography, and it has to be dynamic, engaging, and ‘play nice’ within the established Instagram community. .Text on images looks like marketing. Instagram is your portfolio of images and your scrapbook of moments. Would you want someone marketing to you in those places? Both Instagrammers and Millennials can smell the scent of marketing and inauthenticity a mile away – and go running. UGC – user (in this case employee) generated content. Instagram isn’t about the polished corporate graphic. Save that for Twitter. Nor is it about sharing all the images, all the time. It’s about being in the moment, and experiencing life as it unfolds through the eyes of others – creatively, humorously, and vibrantly. Can you say what you want to say with just an image? Even if you didn’t fill out any text or hashtags, does that image speak a 1000 words all on its own? No? Then you should rethink your Instagram strategy. Videos that were MADE for Instagram. Talking head videos are useful employer branding assets, but best when used on a Website or a job description. Instagram video is a separate asset (just as all social video should be.) Only recently did Instagram open up their video requirements and allow for 60-second videos, over the traditional 15-second limitation. However, remember that Instagram is also a social media channel that is almost 100% mobile. You can NOT upload a photo from a desktop. That means you’re dealing with a mobile attention span, in that you’ve probably got less than 15 seconds. It’s also one of the few channels where video apps allow you to create specific types of video. Boomerang (a looping 3 second clip,) Hyperlapse (a sped up video;) these match the platform. They are specific and engaging. Engagement. 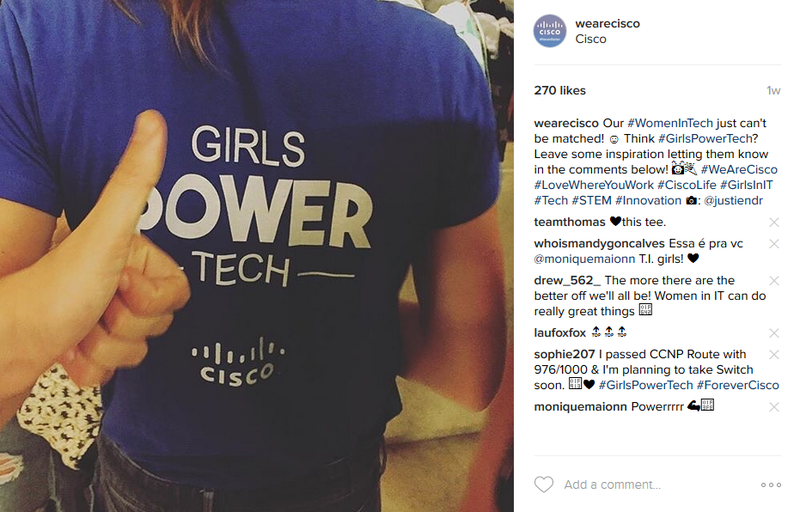 If an employee tags #WeAreCisco or @WeAreCisco, we see it. We respond. We ask for permission (rather than assuming we can use it) to post the photo. And we don’t use Repost. We publish each photo organically, tagging the respective employee to give them significantly more exposure. And employees love their 15 minutes of fame. Voice. 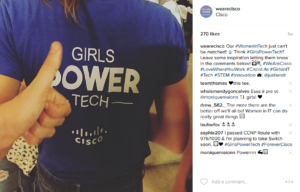 If you look at any WeAreCisco social media channel, you’ll see we “talk” like a human being. Like a coworker. If the employees aren’t backing up what your culture presents to the world, you can’t be authentic. People on Instagram especially want to be a part of a community and constantly connecting, not looking at marketing. Grown our followers from zero at launch, to over 10,000 followers. Only after reaching a significant number of organic followers did we even consider paid advertising. And even then, if you look at a paid “ad” and an organic Instagram post, you’ll see that there’s not much difference. We don’t market, we amplify an authentic employee viewpoint as our culture story. Maintained and exceeded engagement rates. As we’ve grown our followers, we’ve kept and exceeded average engagement rates. Our employee base audience has allowed our engagement numbers to maintain even through Instagram launching an algorithm that would hurt engagement for most brands. If your goal is only increasing follower count, or you have to pay for engagement, to use a social meme saying, you’re doing it wrong. You could have 100K followers, but if you’re engagement rate is below 1% of those followers, you’d be better off on a different social channel. Developed a content calendar that is filled with employee content two months out. 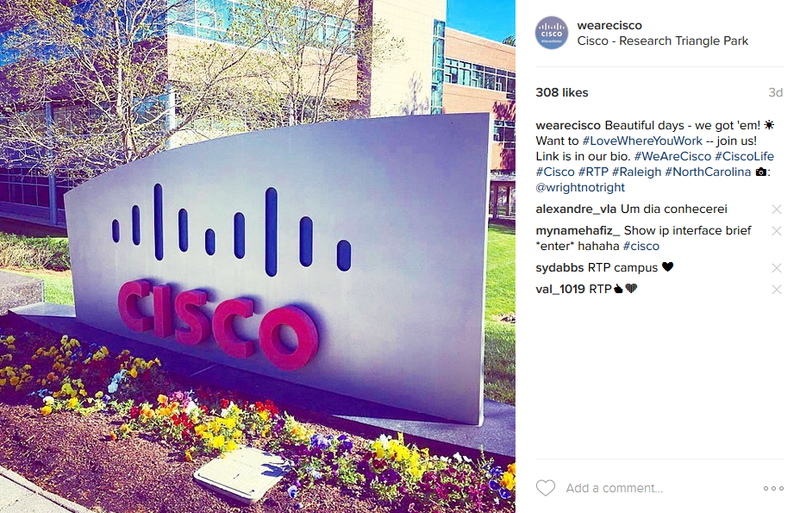 Employees love tagging their photos with #WeAreCico and #LoveWhereYouWork. So much so that we encouraged more of it with an all-employee contest. Even after the contest was over, we spend a lot of time looking at the hashtags and engaging. We developed trainings that helped to show our employees what we’re looking for, and even how to take better pictures. As a result, our content calendar is now entirely user generated content. Driven clicks to our career site. Instagram is tricky. You can only have one clickable link on your profile. We made that link our careers site. Whenever we run a boosted post, we link to the careers site. While our main goal is engagement and followers right now, we’re driving significant traffic to our jobs.